A couple that have recently taken over the licence for a pub in Morley are supporting a new brand of beer that has been created to raise money for charity. The ale is rather special as it has been invented by one of the Sportsman Inn's locals, British Army war veteran Simon Brown, the Morley Observer reports. Rachel and Frank Valentine, who run the establishment, are backing regular Mr Brown and his two friends Pete Dunning and Dan ‘Baz’ Whittingham. The pair were also injured in action while fighting for our country. National brewer Marston’s partnered with the trio to create the blonde ale and sales will raise money for the Help for Heroes charity, which provides better facilities for British servicemen and women who have been wounded or injured in the line of duty. Ms Valentine, who took over the licence at the Sportsman Inn in October last year, told the newspaper: "As soon as I saw that Simon’s beer was available to stock in the pub, I was straight on the phone ordering cases of the stuff. Mr Brown, Mr Dunning and Mr Whittingham are all members of the charity's 'Band of Brothers', which offers lifelong support to ex-servicemen and women. According to the brain behind the beer, all three men are grateful to the pub and Mr Brown is overwhelmed by the support he has received from the Valentines. He said he hopes those who frequent the Sportsman Inn will try his creation and "raise a glass to our wounded veterans". The bottle is labelled "Created by Heroes; Brewed by Marston’s; Enjoyed by Everyone" and five pence from every one sold will go to the charity. 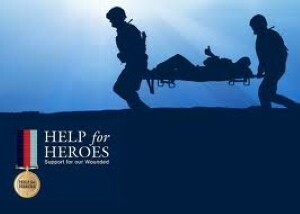 Help for Heroes was launched in 2007 by Bryn and Emma Parry after they visited soldiers at Selly Oak Hospital in Birmingham.